Hope for Pets: Hey There, Delilah! Update May 30: Delilah went home with Lori, her daughter and two other dogs. Lori reported that Delilah is an absolute sweetheart! They slept together last night and Delilah is quite the cuddle bug. 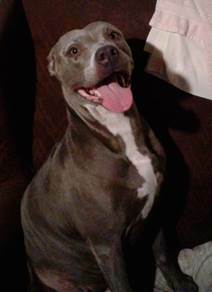 Urgent - Delilah is a healthy, friendly, 5 year old pit bull who needs a new home. Friends are visiting her twice a day, while her owner, Gregory, remains at the Hope Hospice House. Delilah is friendly and eager to please. She walks nicely on a leash. If you know someone interested in adopting this loving dog, please call Colette at (239) 985-7728 for more information.